If you live in the Kansas City area, you MAY be ready for SPRING !!! What better way to Celebrate the Season than to Network with ladies from all over the City !!! Our next event is Wednesday, March 20, 2019 so make plans NOW to join us. Women In Networking, Connecting For Christ meets once a month on the 3rd Wednesday of each month, weather permitting, and YOU are invited. 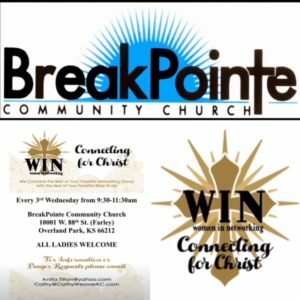 We meet at 9:30am at BreakPointe Community Church in Overland Park so be sure to bring lots of business cards and a door prize, if you wish. At each event, we offer a chance when you arrive (9:30am) to Network with the other ladies and our vendors. The vendors are pre-selected and scheduled well in advance of each month’s event so be sure to connect with me after each event if you would like to get on the schedule for future months. Visit our facebook page to stay in touch with the other ladies who have connected with us and to keep track of our upcoming events.